Retrograde Pyelogram Surgery India offers information on Retrograde Pyelogram Surgery in India, Retrograde Pyelogram Surgery cost India, Retrograde Pyelogram Surgery hospital in India, Delhi, Mumbai, Chennai, Hyderabad & Bangalore, Retrograde Pyelogram Surgeon in India. A retrograde pyelogram is a type of x-ray that allows visualization of the bladder, ureters, and renal pelvis. Generally, this test is performed during a procedure called cystoscopy - evaluation of the bladder with an endoscope (a long, flexible lighted tube). During a cystoscopy, contrast dye, which helps enhance the x-ray images, can be introduced into the ureters via a catheter. As the techniques and technology of ultrasound (high-frequency sound waves) and contrast dye have improved, other procedures such as intravenous pyelogram (IVP) and renal ultrasound have become more commonly used than retrograde pyelography. 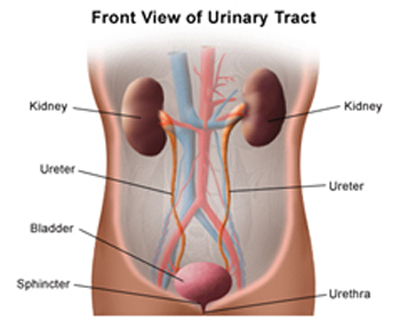 Other related procedures that may be used to diagnose problems of the upper urinary tract include kidney, ureters, and bladder (KUB) x-ray, computed tomography (CT scan) of the kidneys, renal ultrasound, renal angiogram, intravenous pyelogram, antegrade pyelogram, and renal venogram. Please see these procedures for additional information. Narrow tubes that carry urine from the kidneys to the bladder. Muscles in the ureter walls continually tighten and relax forcing urine downward, away from the kidneys. If urine backs up, or is allowed to stand still, a kidney infection can develop. About every 10 to 15 seconds, small amounts of urine are emptied into the bladder from the ureters. A triangle-shaped, hollow organ located in the lower abdomen. It is held in place by ligaments that are attached to other organs and the pelvic bones. The bladder's walls relax and expand to store urine, and contract and flatten to empty urine through the urethra. The typical healthy adult bladder can store up to two cups of urine for two to five hours. A retrograde pyelogram may be used in persons suspected to have an obstruction, such as a tumor, stone, blood clot, or stricture (narrowing) in the kidneys or ureters. It evaluates the lower portion of the ureter to which urine flow is obstructed. A retrograde pyelogram is also used to evaluate placement of a catheter or a ureteral stent - a wire mesh designed to prop open the ureter. An advantage of the retrograde pyelogram is that it can be performed even if the patient is allergic to contrast dye because a minimal amount of the contrast dye is absorbed by the body (unlike another more common test called an intravenous pyelogram). The procedure may also be performed on persons with impaired kidney function. There may be other reasons for your physician to recommend a retrograde pyelogram. You may want to ask your physician about the amount of radiation used during the procedure and the risks related to your particular situation. It is a good idea to keep a record of your past history of radiation exposure, such as previous scans and other types of x-rays, so that you can inform your physician. Risks associated with radiation exposure may be related to the cumulative number of x-ray examinations and/or treatments over a long period of time. Patients with kidney failure or other kidney problems should notify their physician. In some cases, the contrast dye can cause kidney failure, especially if the person is taking Glucophage (a diabetic medication). There may be other risks depending on your specific medical condition. Be sure to discuss any concerns with your physician prior to the procedure. You will need to fast for a certain period of time prior to the procedure. Your physician will notify you how long to fast, whether for a few hours or overnight. Notify your physician if you have ever had a reaction to any contrast dye, or if you are allergic to iodine or seafood. Notify your physician if you are sensitive to or are allergic to any medications, latex, tape, and anesthetic agents (local and general). A retrograde pyelogram may be performed on an outpatient basis or as part of your stay in a hospital. Procedures may vary depending on your condition and your physician's practices. You will be asked to lie face up on the x-ray table and place your legs in stirrups. The contrast dye will be injected through the catheters. The physician will check for retention of the contrast dye. Your recovery process will vary depending upon the type of procedure performed and your physician’s practices. After the procedure, you will be taken to the recovery room for observation. Once your blood pressure, pulse, and breathing are stable and you are alert, you will be taken to your hospital room or discharged to your home. Your urine output will be monitored closely for volume and signs of blood. It may be red from even a small amount of blood. This is considered normal and does not necessarily indicate a problem. You may be instructed to continue monitoring your urine output for a day or so once you are at home. You may experience pain when you urinate. Take a pain reliever for soreness as recommended by your physician. Aspirin or certain other pain medications may increase the chance of bleeding. Be sure to take only recommended medications.